Under the Sixth Amendment to the U.S. Constitution, all criminal defendants have a right to, among other things, a public trial. It is generally believed that transparency in criminal trials is the best guard against corruption, and a good way to help ensure that the defendant receives a fair trial. Accordingly, you can go to your local courthouse and, with very few exceptions, walk into a courtroom and observe the proceedings at your leisure (though I can’t guarantee that you won’t be bored to tears after five minutes). The Supreme Court has read this provision quite broadly, holding that the right to a public trial exists solely for the protection of the defendant, and that the right extends beyond the actual “trial” phase of a criminal proceeding, to include pre-trial matters (such as motions to suppress evidence, etc. ), and post-trial sentencing. The U.S. Supreme Court just decided an interesting case on this subject, called Presley v. Georgia (full opinion, PDF). It started when Eric Presley’s trial for drug trafficking was about to begin. The pool of potential jurors was brought into the courtroom, and asked to sit in the spectator seats until they are called to answer questions posed by the prosecution and defense attorneys. 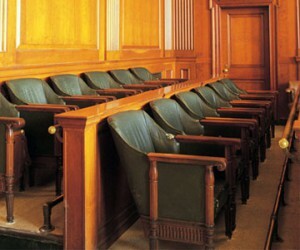 The judge noticed that there was a single spectator sitting in those seats, and, when questioned, the spectator revealed that he was the defendant’s uncle. The judge, over the defense’s objections, ordered the uncle out of the courtroom, but told him that he could come back once jury selection was complete. The trial went forward, and the defendant was convicted. On appeal, he argued that the ejection of his uncle from the courtroom violated his right to a public trial. The Supreme Court agreed. The Court reasoned that the trial court’s concerns about a family member of the defendant intermingling with the prospective jurors, and a lack of space in the courtroom, could have easily been assuaged by other means. For example, if the trial judge wanted to give jurors first priority for seating, he could have ordered the uncle to stand, while still allowing him to observe the proceedings. He also could have given the jury strict instruction (as is common practice) not to discuss the trial with members of the public, or interact with anyone involved in the case. In addition, he could have instructed the uncle not to speak with the jurors. This would have protected the defendant’s right to a public trial, and addressed any concerns about the uncle’s presence prejudicing the trial. While this case was relatively small and won’t go down in history as being terribly consequential, it’s still important in its own way, and correctly decided in my view. While excluding this particular defendant’s uncle from a small portion of the proceedings likely had no effect on the outcome of his particular case, the Sixth Amendment was written for a reason. The founders likely knew that making trials private or secretive might not automatically prejudice the defendant, or create corruption. However, it greatly reduces accountability. They say that sunlight is the best disinfectant – to prevent or stop corruption and abuse of power, in needs to be exposed to the light of day. That is why the right to a public trial exists – to create a culture in which the conduct of judges and lawyers can be seen by the public. This seems like a difficult question, until you ask a follow-up question: what is the alternative? Legal rights, to have any meaning, must have a legal remedy. Is there any legal remedy which will protect the defendant’s rights while hopefully deterring future violations of those rights? I can’t think of one, besides the one that we have: throwing out the conviction.